Santa Rosa, Calif. -- Transparency and authenticity in marketing are essential if producers of “green” wines are to succeed in building their consumer base, according to vintner and sustainability apostle Paul Dolan, who emceed the general session of the second Green Wine Summit yesterday. Around 40% of shoppers don’t buy these wines because “they never see them” on retail shelves,” according to a recent Wine Opinions survey of high-frequency wine drinkers (once per week or more). That figure from 2009 is actually an improvement: In a similar 2007 survey, 49% gave the same response, according to Wine Opinions research director Christian Miller. More positive news: The most recent A.C. Nielsen retail scans showed that while table wine sales in general had grown by 3.3% during the past year, “organic wines” were up 12% during the same period, despite typically higher price-points. Brian Lechner, director, client services for The Nielsen Co., who has been tracking online wine buzz, said the conversation about green wines is still minuscule compared with wine talk in general. Web threads about organic or sustainable wines totaled only about 14,000 of 2.34 million on wine in general; a preponderance focused on reviews and definitions of terms. It’s important for wine marketers to help these people -- largely still undecided on the merits, and leery of greenwashing -- to sort out how the various levels of green winegrowing/winemaking relate to the taste of wine; social responsibility and environmental impact. Most importantly, Lechner said, green-certified wines must let buyers know how their practices benefit the consumer. What is sustainable? What is organic? According to Miller, Wine Opinions research revealed a small increase in confused consumers between 2007 and 2009. As certification programs proliferate, will this confusion grow even more? “They don’t understand the difference between wines made with organic grapes and wines labeled organic,” he said. Along with confusion, consumers also exhibit skepticism, Miller said, noting that 81% of respondents agreed that the green claims of a product don't mean very much. “The concept of greenwashing is well understood, and there is lots of suspicion,” he said. The industry must work toward standards of clear and consistent labeling, Miller urged. “If individual brands go their own way, it’s cacophony.” The wine industry can only benefit from providing visibility and confidence to consumers, Miller said. Retailer and master sommelier Peter Granoff, a partner in San Francisco’s Ferry Plaza Merchants, emphasized, “It’s incumbent on the industry to get together” on this issue, if it’s to achieve economic sustainability from its environmental efforts. The subsequent panel, “Celebrating Innovation and Leadership,” had seven vintners, conservation experts and vineyard professionals touting the benefits of nearly as many certification programs now being used in California vineyards and wineries. 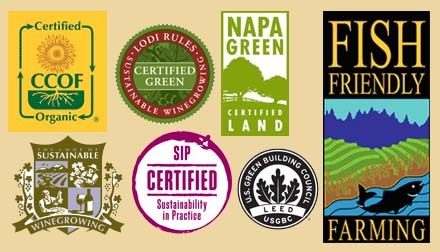 With this abundance of options, Paul Dolan counted 55 wineries certified as making wine with organically grown grapes; and just 13 making certified-organic wines (with no sulfur dioxide/sulfites added at the winery). He said he looks forward to the “development of clarity,” allowing consumers to understand the choices available, now and in the future. The Green Wine Summit ran from Tuesday afternoon through Wednesday evening at the Hyatt Vineyard Creek in Santa Rosa, Calif. Co-chairs Lesley Berglund and Mack Schwing said attendance matched last year’s inaugural conference total of 340. A team of more than 60 speakers conducted the three general-session presentations and 10 breakout sessions. Twenty-one wine industry suppliers and organizations were sponsors of the event and/or participants in the Green Showcase that accompanied the conference sessions. Many of the speakers presentations will be posted on the summit website, greenwinesummit.com.